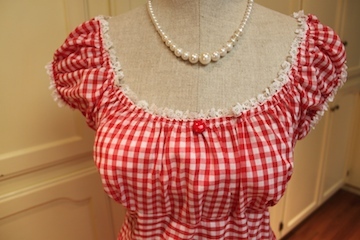 The Picnic Dress was inspired by the red and white gingham fabric I found in my stash of fabric. It happened to be the only fabric I had with even close to 5 yards, but still it wasn't enough, since the width was only 24 inches vs the 60 inch width of the sheets I used on the sheet dress. Remember this was happening in the middle of the recession, so I was trying very hard not to buy new fabric. The skirt part of the dress was where the bulk of the fabric is used in this Vogue pattern, so I decided to change the Vogue skirt pieces to a skirt pattern that would require much less fabric. I also wanted to try something easier than the buttons. 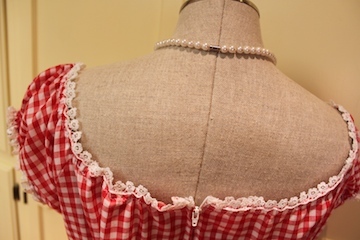 I had already tried bra hooks on the sheet dress, and snaps on the Red Hat blouse. 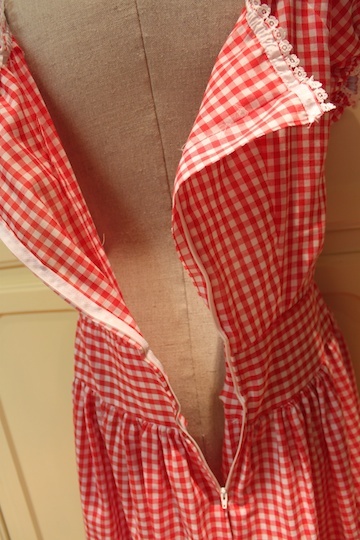 I decided on elastic for this picnic dress! How about a peasant top? I had made plenty of them as a teen. So I found an old pattern with a peasant top pattern, and put that in place of the upper part of the Vogue upper pattern pieces. I used the bodice (middle) from the Vogue pattern, and the skirt section of the dress from another pattern. In the end, there was only one section l used from the Vogue pattern. So I prepared the fabric (wash, dried, ironed) , laid it out, pinned, marked, clipped, and cut. It got a little tricky working the patterns together, since each section was from a different pattern. The upper, middle bodice and skirt all from different patterns. It went together without too much trouble, A little patience and finessing worked it out. This fabric was light cotton, with no lining, so it ended up being very light weight, and didn't hang well. I made it in quickly (maybe a few hours), and wore it to an Italian dinner. I had to wear a slip because I didn't line it, and the dress kept riding up because it didn't have any weight, therefore showing the slip. I think I will line the dress and make a couple of adjustments at the hip to hopefully improve the way it hangs. At the very least this would be comfortable to wear at home on a hot summer day. Line the dress or use heavier fabric, and mixing patterns pieces worked out pretty well. 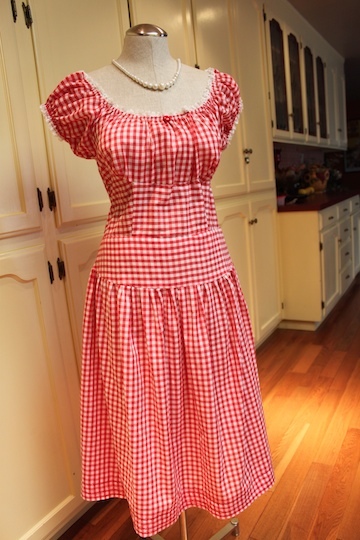 I think I'll do at least one more picnic dress and maybe even a whole line of picnic dresses. 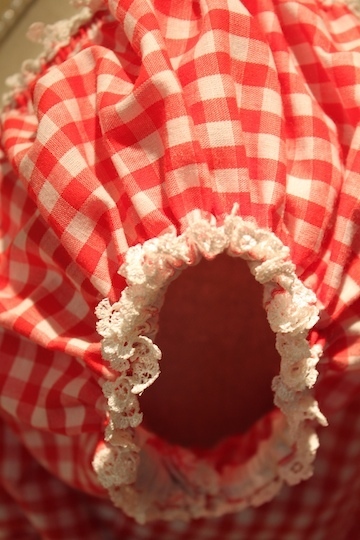 I really love the peasant top with a full skirt like the sheet dress, so i'd like to do it again. Of course the rick rack trim and some cool retro buttons.